Go Realty Unplugged: Open House for Halloween? Could be Brilliant! 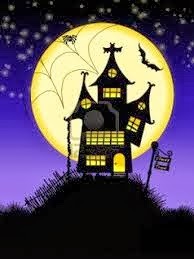 Open House for Halloween? Could be Brilliant! For my home court listing, 700 Brittley Way, I will be setting up a table at the end of the driveway on Halloween night. There will be flyers of course, a candy bucket, and a cooler full of beer and sodas which will be passed out to parents with one of my koozies. there will also be an assortment of huge candy bars (I think, read on) that will be offered to kids who venture up to the third floor bonus room. I may have a "room full of candy" instead of the big bars with multiple buckets that kids can grab a hand full from. My seller will be up there passing out candy. Kids must have a parent go with them to tour the home. Pretty good press for me and it will make a lasting impression on my client. Not all of us have a listing in our neighborhood; also, that evening may be dedicated family time. But perhaps there is a way for you to benefit your sellers from this and other holidays. What's great is creative thinking. Consider a spooky theme for your open house event the weekend before Halloween, a costume for making pop-by deliveries on Halloween day, or just making sure you take advantage of the photo opportunities for Facebook and blogging posts.